Station-53 satellite internet access service for yachts with VoIP option. When operating to vessels on lakes, rivers and at sea the satellite dish must accurately track the satellite as the vessel moves. This requires that the satellite dish be stabilised, in this case using a gyro stabilised platform within a white weather cover radome. The radome permits the two-way satellite transmissions but stops the wind and weather from affecting the dish pointing accuracy. 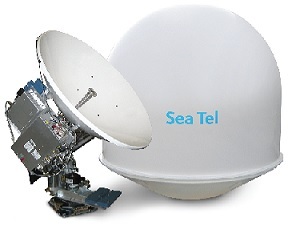 VSAT equipment: The company offers a range of autotrack Ku band SeaTel antennas, Model 4009 1m, Model 5009 1.24m, Model 6006 1.5m diameter. Phone: + 1 843-564-4028 Direct. Offices in USA and Italy. ► Page created 27 June 2005, amended 7 Dec 2014, 18 Mar 2019 HTML5. All pages on this satsig.net web site are Copyright Satellite Signals Limited © 2005 all rights reserved.